Note to self: get plastic bags and wrap cameras. So I grabbed some old grocery and a few ziplock bags, then headed out the door. I wanted to get to the library early so I can get a parking spot that would allow me easy access to escape the masses. I also made sure to put UV filters on my lenses. 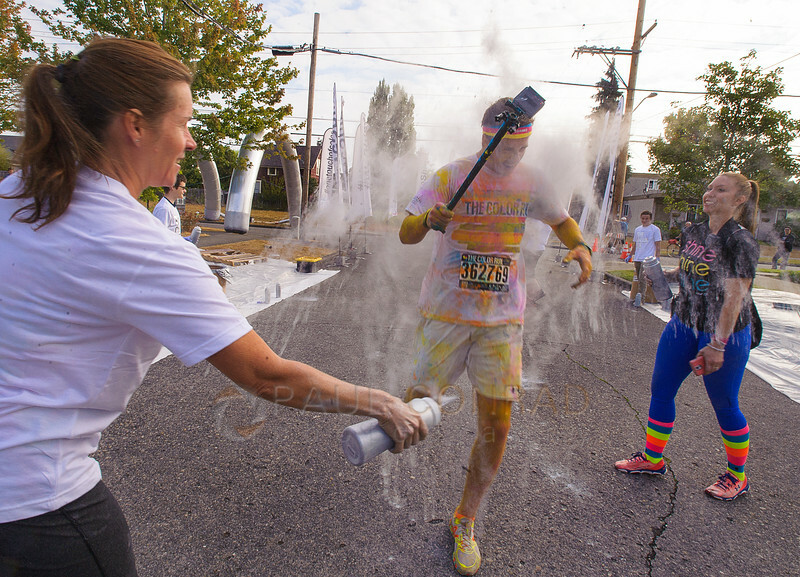 © Paul Conrad/The Bellingham Herald – Volunteers Holley Bennett, left, and Carleeh Mulholland powder a participant runs through silver checkpoint during the debut of The Color Run 5K through downtown Bellingham. Once I got my gear wrapped and taped up so as not to get them destroyed by the colored powders (I was warned by a few friends and fellow photogs), I headed to the race to get some info. 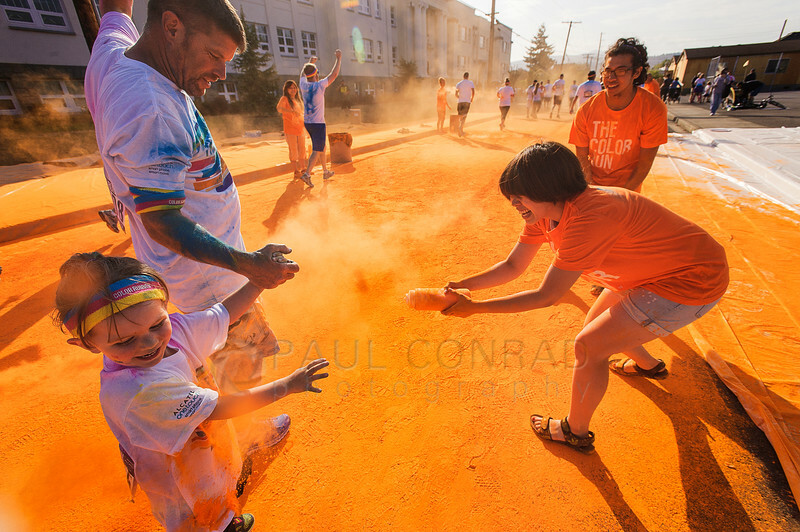 © Paul Conrad/The Bellingham Herald – Participants get sprayed by volunteers Mayu Takahashi and Jeff Bermudes, both from Bellingham, as they run through colored powders during the debut running of The Color Run 5K through Bellingham. I did a quick check of the course and found out that the race had “color stations” with volunteers spraying participants with powder. There were two within a 6 blocks of the finish line so I stuck with those as it was only a 5K. 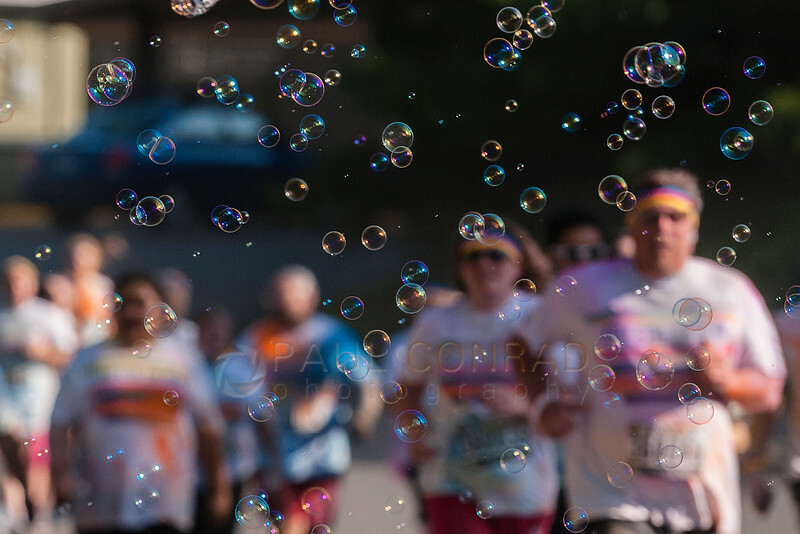 © Paul Conrad/The Bellingham Herald – Participants run through bubbles as they approach the finish line during the debut running of The Color Run 5K in Bellingham. As I shot, I made sure to continually clean my lens with the 1/2 dozen lens cloths I brought. I didn’t want to use cleaner as I think it would have caused the powder to cake on the lens and cause more harm than good. 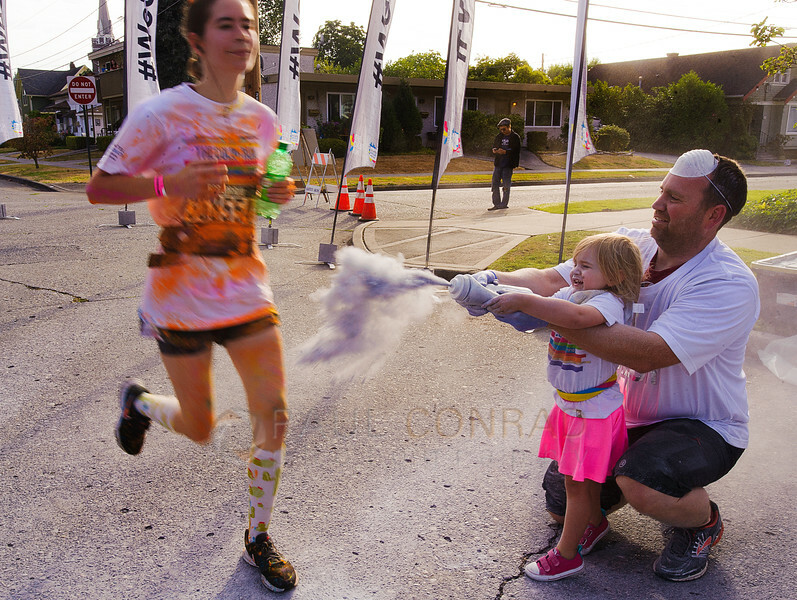 © Paul Conrad/The Bellingham Herald – Volunteer Bob Horne and his daughter Sadie, 3, of Sedro-Woolley spray a participant as she runs by during the debut The Color Run 5K through Bellingham. The only worry I really had was having to unwrap the cameras to change the cards. But that was easily solved by moving away and upwind from the stations to keep the chances low of getting any powder in the card slots. 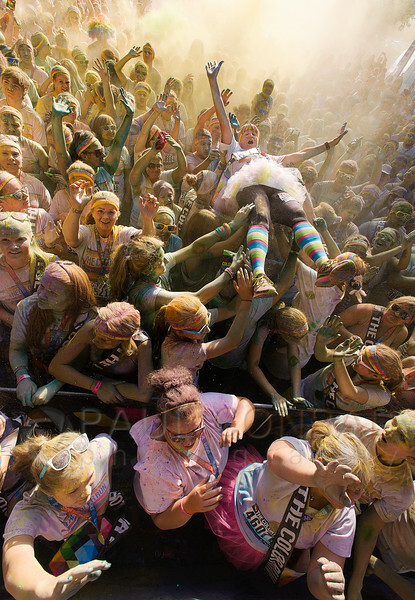 © Paul Conrad/The Bellingham Herald – A crowd surfer is helped over a sea of particpants as they attend a DJ concert after completing in the the debut running of The Color Run 5K in Bellingham. When participants finished the course, they were treated to a DJ playing on a stage. After I finished shooting people getting sprayed with colored powders, I headed over to the finish area to get some images of people having fun. © Paul Conrad/The Bellingham Herald – The energized crowd during the after party for the debut The Color Run 5K in Bellingham. I loved the backlighting on the people as they danced to the DJ and threw powder everywhere. 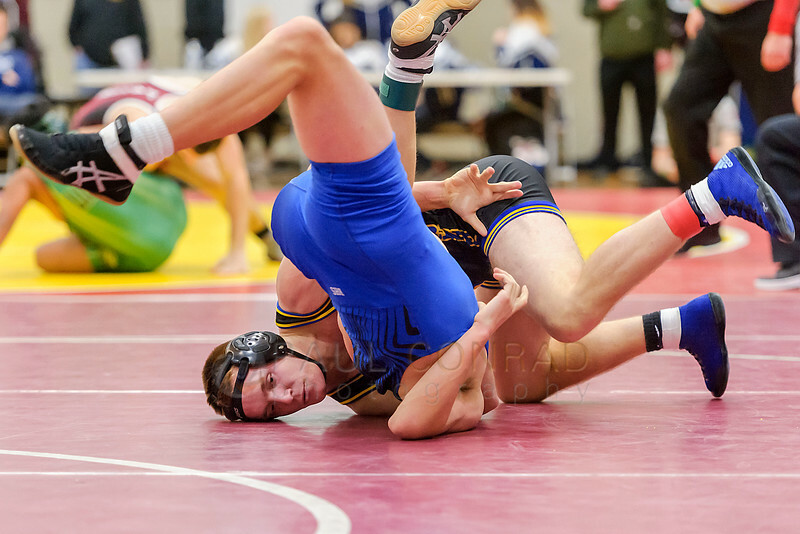 It made for some great pictures. Problem was that I was too low and needed to get on stage. 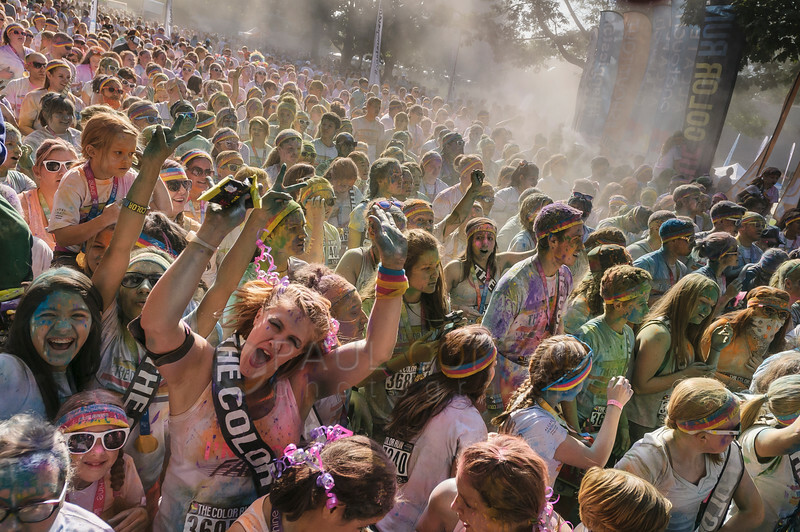 © Paul Conrad/The Bellingham Herald – Participants and spectators celebrate finishing the debut The Color Run 5K during the after party in Bellingham. So, I went to the side where there were stairs confidently walked past two security guards and went on stage. I kept quiet, shot a lot, and stayed out of the way. It worked. I was on the stage for a good 45 minutes before I left. 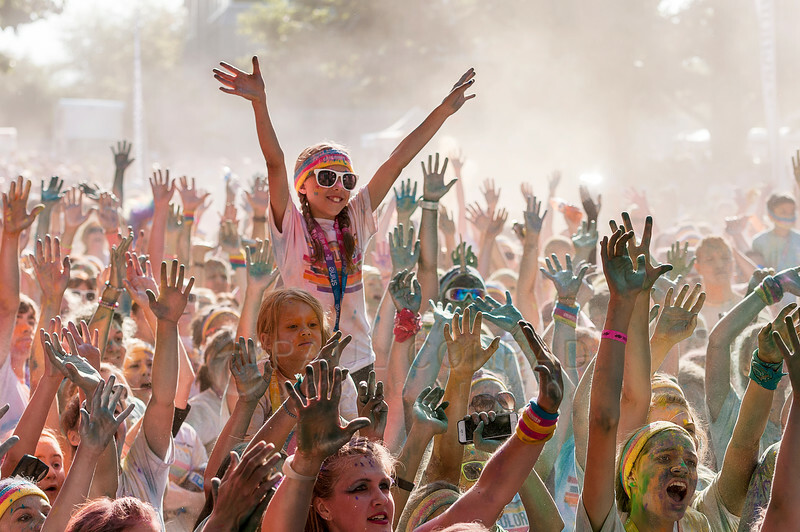 © Paul Conrad/The Bellingham Herald – People celebrate during the after party for the debut The Color Run 5K in Bellingham. 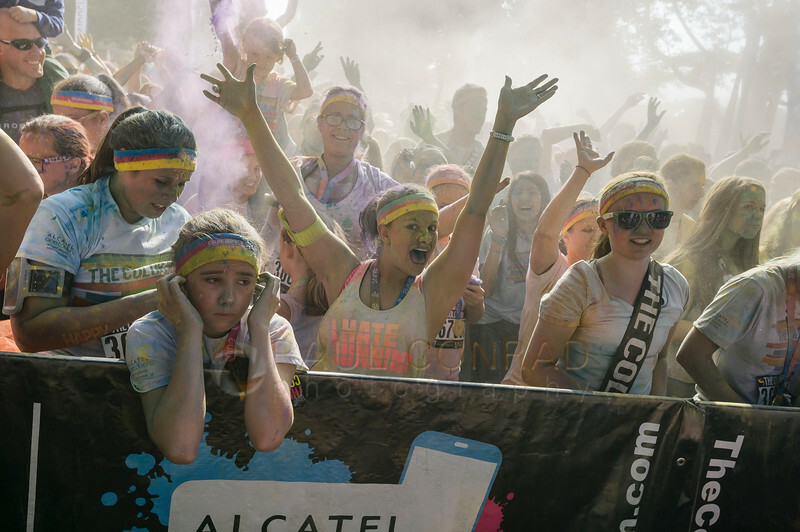 Overall, it was fun and exciting to cover the debut of The Color Run here in Bellingham. And yes, my cameras survived the onslaught of the colored powders.